An industry idol of mine, Marty Weintraub, once told me that to get your career to really take off in the Internet marketing industry you have to give yourself to the community. Abundantly and selflessly, with no limits and with nothing expected in return. The SEM Synergy podcast was born in this spirit in the spring of 2008. It was Bruce’s hope that he could contribute to the community a platform for impassioned debate, critical analysis, in-depth news reporting and hands-on tactical advice. The nearly 150 episodes of SEM Synergy have been the product of a project driven by a few simple forces: Bruce and the team of SEOs, marketers, programmers and designers love what we do, enjoy talking about what we love, find it endlessly rewarding to take part in the lively industry-wide conversations, and feel encouraged by positive feedback from those who listen to the show. It’s because we love the show that we continually evaluate ways to keep it relevant and useful to the community. We know that SEM Synergy is due for renovation. So with the turn of the new calendar year, we’ll be introducing a fresh format we think is in line with the demands of today’s users and what technology makes possible. Expect short videos that answer viewer questions, review tools and tactics, and interview experts. We’ll be experimenting with livestream, real-time Q&A and other forms of engagement, too. In many ways, the growth and change of the podcast has mirrored the growth and change of the industry. Today, Internet use is dominated by a dynamic experience, demands instant gratification, and is enhanced by visual components. The content and media that will flourish in this environment reacts nimbly, is deftly responsive to user needs, and is easy to digest. We hope the new SEM Synergy format accomplishes these objectives. In its new incarnation, Bruce Clay, Inc.’s YouTube channel will be the show’s primary outlet. While the show has evolved over the years ━ passing hands here in the Bruce Clay, Inc. office, expanding subject matter as the technology landscape changes, and experimenting with new multimedia formats ━ one unflagging constant has been the support from the team at WebmasterRadio.fm. We have nothing but gratitude and appreciation for WebmasterRadio’s role in the history and success of SEM Synergy. Brandy and Daron’s support helped make the show possible when they welcomed SEM Synergy into the WebmasterRadio family. We’re proud of the extensive archive of shows that resulted from our partnership. My producer Brasco made sure the show ran like clockwork every week. With affable and accommodating professionalism, I relied on him to post new shows, and he assisted with any editing or recording I might need while I was learning the ropes or on the road. WebmasterRadio.fm is also home to a devoted fanbase that we will miss plugging into each week for endlessly entertaining live chats, including commentary that has inspired show topics and helped me and the BCI team dive deeper into industry issues. 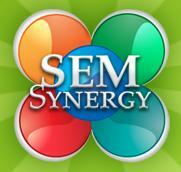 We hope fans of the show will check out our YouTube channel and SEM Synergy 2.0. It’s people watching and listening to the show that give it any meaning, after all. As we transition to a new format, we’ll be relying on your feedback and critiques to create something worth watching. We have goals and ideas in mind, but we’re most excited about the potential the new format holds. It’s an exciting period of growth and change that we hope will be directly shaped by the community we’re part of. Lisa :) *blush* Let’s just say I’m really excited to see what we can do with the new format. Congrats on the transition, can’t wait to see what’s in store. As someone who was there when it started, I can vouch that SEM Synergy – it’s success and it’s existence — has been a product of YOU and YOUR hard work. You were the driving force behind launching and you’ve run a great show. So thank you. And again, can’t wait for the next chapter of it.